Last Thursday and Friday, Sept. 10th and 11th, about 70 agile fans met in Baarn, Holland, for the Agile Open 2009 edition. 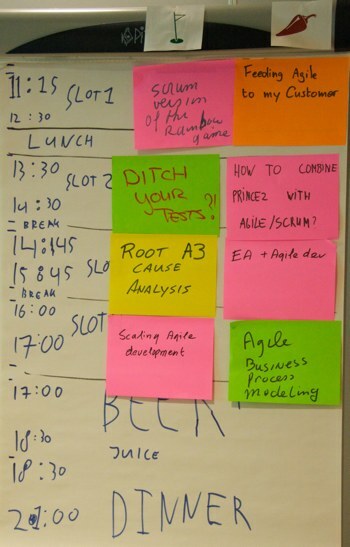 The open space event was organised by Agile Holland in the premises of VxCompany: a very nice location logistically as close to perfect for this type of events as I’ve seen to date, from the room setup to the facilities to the food and drinks. As it was an open space, I arrived prepared to be surprised. But the surprises I got exceeded all my expectations: people engaged in the various discussions very fast and soon there were plenty of ideas roaming around and constantly developing. I’ve met plenty of highly skilled and open people. Somebody twitted that agile is an attitude: I fully agree with this view and everybody I met there was having that attitude and living it! I participated in sessions with subjects like how to use agile methods outside of the software realm, what are the characteristics of inspirational persons in agile, how an agile coach should interact with the customer and how would it be possible to improve the CMMI level of an organisation using agile. In all of them I learned something and the level of contribution was incredibly high! So much about the quality, but there was also quantity: there were six possible rooms for sessions, four slots on Thursday and three on Friday, and we managed to fill them all, thus needing to create more slots and even having sessions in the parking lot! I proposed two sessions: one about archetypes in agile and one about the meaning of vision, values and identity in an organisation. I will post the raw data on the previously mentioned wiki pages, but watch out for a polished summary of the ideas on these pages some time, hopefully in the near future. Overall a great event: though I joined it as I was anyway in the area, I am definitely thinking about coming back next year, even if this would be the only reason for the trip! A special thanks to the organisation and to all the people I interacted with during the two days and generating so many good ideas! Who’s Chunking Up Your Project?